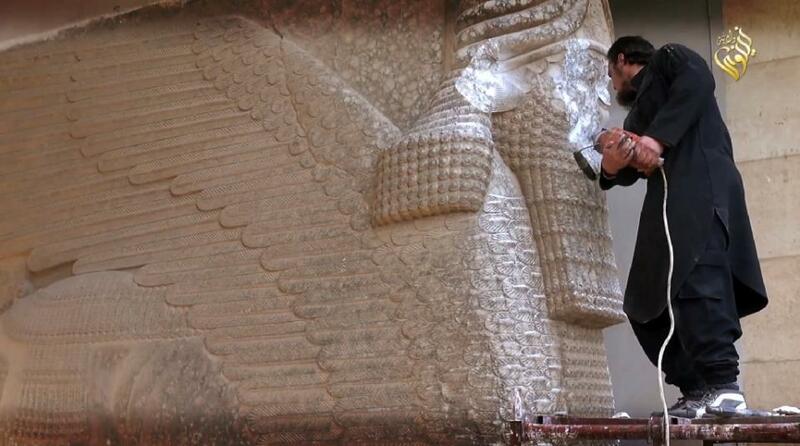 Baghdad (AFP) – Condemnation poured in Friday of the Islamic State group’s bulldozing of the ancient city of Nimrud, the jihadists’ latest attack on Iraqi cultural treasures that the UN termed a “war crime”. After rampaging through Mosul‘s museum with sledgehammers and torching its library last month, IS “bulldozed” the nearby ruins of Nimrud Thursday, the tourism and antiquities ministry said. Antiquities officials said IS militants had moved trucks last week to the site overlooking the Tigris River, 30 kilometres (18 miles) southeast of their main hub of Mosul. “Until now, we do not know to what extent it was destroyed,” one official said. Nimrud was the latest victim of what appears to be a systematic campaign by the jihadists to obliterate Iraq’s rich heritage. “I’m really devastated. But it was just a matter of time, now we’re waiting for the video. It’s sad,” Abdulamir Hamdani, an Iraqi archaeologist from Stony Brook University in New York, said of the propaganda film of the destruction that IS is likely to release. Nimrud was founded in the 13th century BC and was considered the jewel of the Assyrian era. Its stunning reliefs and colossal statues of winged bulls with human heads guarding palace gates filled the world’s museums in the 19th century. A collection of 613 pieces of gold jewellery, ornaments and precious stones discovered in a royal tomb in 1988 has been described as one of the greatest archaeological finds of the 20th century. “Their plan is to destroy Iraqi heritage, one site at a time,” said Hamdani. “Hatra of course will be next,” he added of a 2,000-year-old UNESCO-listed site about 100 kilometres south of Mosul known for its beautifully preserved temples blending Hellenistic, Roman and Eastern influences. Irina Bokova, the head of the UN’s cultural body UNESCO, condemned the destruction of Nimrud “with the strongest force”. “We cannot stay silent. The deliberate destruction of cultural heritage constitutes a war crime, and I call on all political and religious leaders in the region to stand up against this new barbarity,” she said Friday. UNESCO has called for tougher action to protect the many heritage sites in one of the cradles of civilisation, but little can be done in areas under jihadist control. Grand Ayatollah Ali al-Sistani, Iraq’s top Shiite cleric who is revered by millions, sharply criticised IS’s targeting of the Mosul museum and archaeological sites. It demonstrates “their savagery and their barbarism and their hostility to the Iraqi people”, Sistani’s representative said on his behalf at weekly Friday prayers in Karbala. The destruction was met with condemnation and sadness on Baghdad’s Mutanabi Street, a favourite haunt of Iraqi intellectuals. “After they killed the human spirit, they began killing civilisation,” Ibrahim Dawood, a writer and poet, said of IS. IS tries to justify the destruction by saying the statues are idolatrous, but experts say the jihadists traffic antiquities to fund their self-proclaimed “caliphate” and destroy only those pieces that are too bulky to be smuggled. Stuart Gibson, a UNESCO expert on museums, said pressure from the international community would have little effect on IS. “Unfortunately today the people in the region are exhausted and terrified. The remainder of us can only stand on the outside looking on in absolute despair,” he said. IS still controls large parts of northern and western Iraq, but has been losing ground under mounting military pressure from Iraqi federal and Kurdish forces backed by a US-led coalition and by Iran. Baghdad launched a huge offensive Monday to retake the city of Tikrit, in what commanders have said was a stepping stone toward an even larger operation to free Mosul. Iraqi forces battled IS in the strategic town of Dawr on Friday as they pressed the offensive, officials said. Dawr, on one of the main roads Iraqi forces are taking to reach Tikrit, needs to be captured for the anti-IS offensive to move forward. Since they swept through Iraq’s Sunni heartland last June, IS has destroyed a long list of religious and heritage sites, including churches and Sunni shrines. Most of Nimrud’s priceless artefacts had long been moved to museums, in Mosul, Baghdad, Paris, London and elsewhere, but some giant “lamassu” statues of winged bulls and reliefs were still on site.